The V&A Hotel offers a variety of rooms to suit all travelers’ needs. From 94 spacious rooms to superior double rooms, rooms with both Mountain and Piazza views and 26 loft rooms you have a wonderful selection to choose from. All the rooms have all the best amenities that will ensure you have a comfortable stay. This hallmark hotel located in the heart of one of Cape Town’s most visited tourist attractions. The V&A Waterfront provides for a fabulous stay. 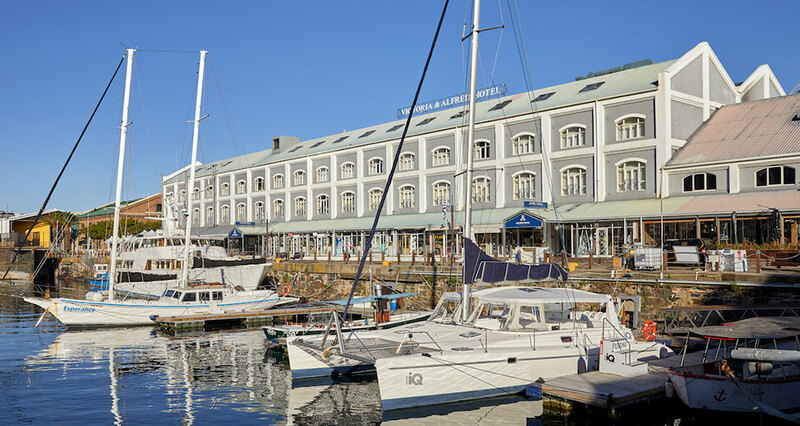 With its colonial style and atmosphere depicting some of the history and heritage from the period of the first travelers to The Cape of Storms, the V&A Hotel compliments what you will experience in the vibrant atmosphere of this world famous working harbor as you step out of the foyer and take time to explore all it as to offer. The V&A Hotel’s magnificent wooden staircase, original telescope, and stunning flower arrangements together with impeccable service by their friendly staff are all the qualities that lend to its elegant, intimate and romantic atmosphere. Having earned the Travel-Leisure’s World’s Best Award in 2012, being rated as one of the Top 15 city hotels in Africa and the Middle East, as well as being the winner of the TripAdvisor Excellence Award in the same year, with these high standards to maintain the Victoria & Alfred will truly meet your every expectation. The V&A Hotel offers a number of wonderful facilities that will make your stay unforgettable. With a designer spa and treatment rooms, gym facilities for guests who wish to keep up with their personal training routines, a swimming pool with its own bar and dining area and a beautiful little garden are just a few to mention that you can look forward to. In the surrounding areas, other activities such as golf, tennis, hiking, horse riding, and yachting can all become part of your daily activities if you so desire. ‘There is a range of wonderful dining places in and around the V&A Waterfront. The choice is endless! Some recommendations in Dash Restaurant & Bar and the OYO Restaurant & Bar, located just below the V&A Hotel overlooking the harbor and with magnificent views of Table Mountain itself.